An interesting freshwater snail to keep is the Rabbit Snail. 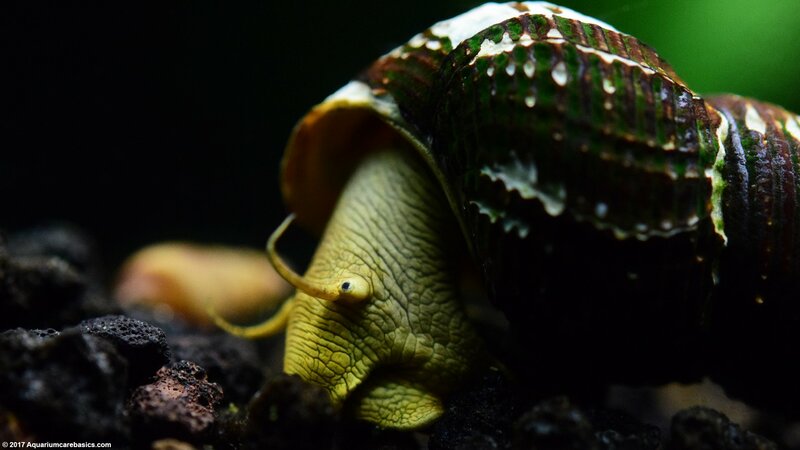 Also called an Elephant Snail, a Rabbit Snail can be a great addition to an established community tank. Rabbit Snails are very peaceful creatures. They are not aggressive by any means, and they seem very curious about their surroundings. Rabbit Snails are active during the day, and can be very active at night. What Are Some Types Of Rabbit Snails? Where Can I See Pictures Of Rabbit Snails? 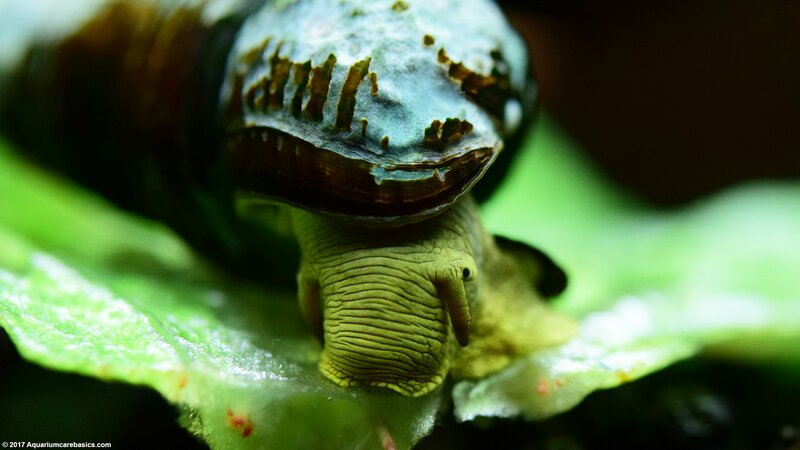 What Are Care Issues For Rabbit Snails? How Big Do Rabbit Snails Get? What Is A Good Tank Size For Rabbit Snails? What Do Rabbit Snails Eat? Do Rabbit Snails Eat Live Plants? What Are Good Tank Mates For Rabbit Snails? 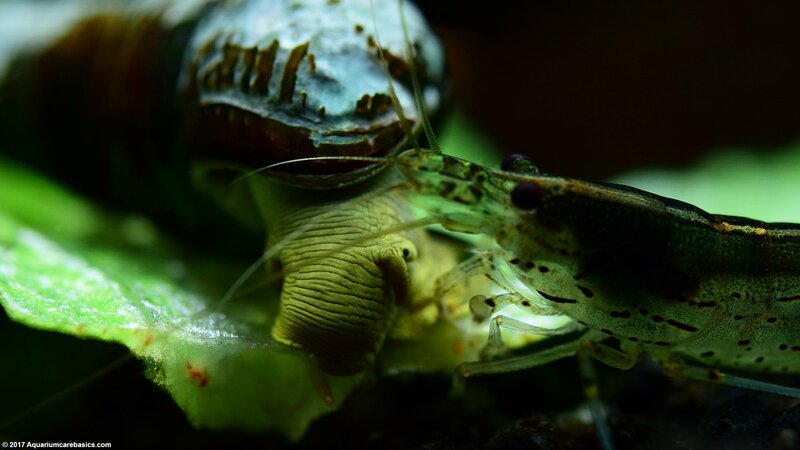 Do Rabbit Snails Reproduce In Freshwater Aquariums? When buying Rabbit Snails, look for snails that appear to be moving across hard surfaces or stuck to the glass. 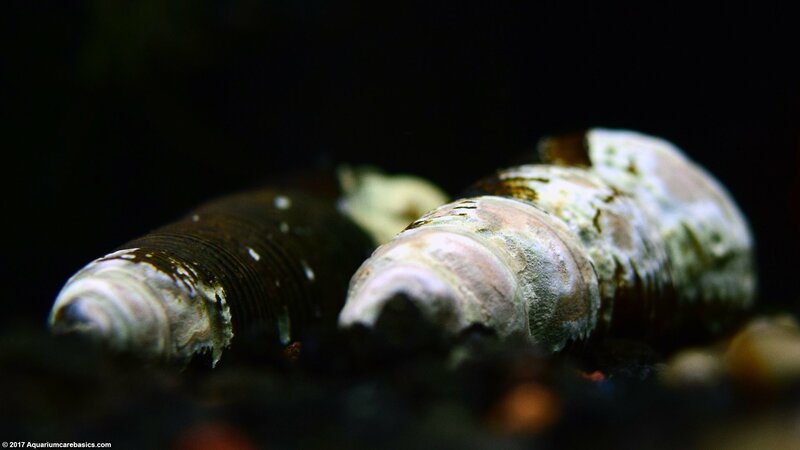 If a Rabbit Snail is motionless on the tank bottom, laying upside down or floating, the snail may be dead or dying. Also, look for snails that have thick looking shells free from cracks, deep pits or evidence of excessive wear. 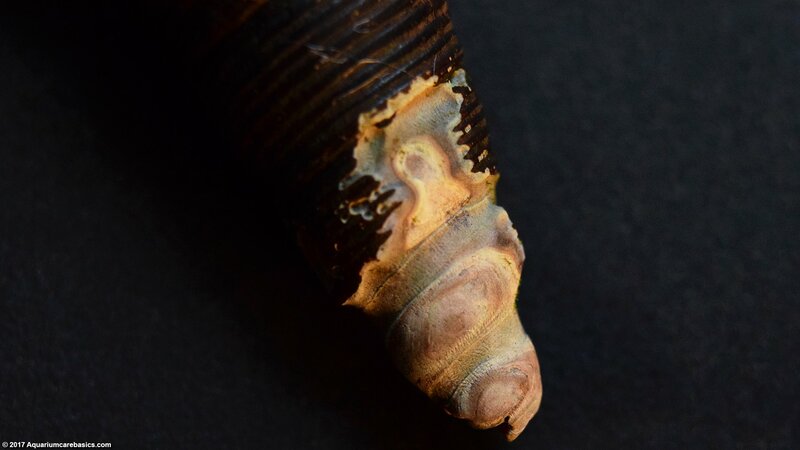 Thin, cracked or worn out shells can be indications the snail is unhealthy or have been in water that was acidic or low Calcium. 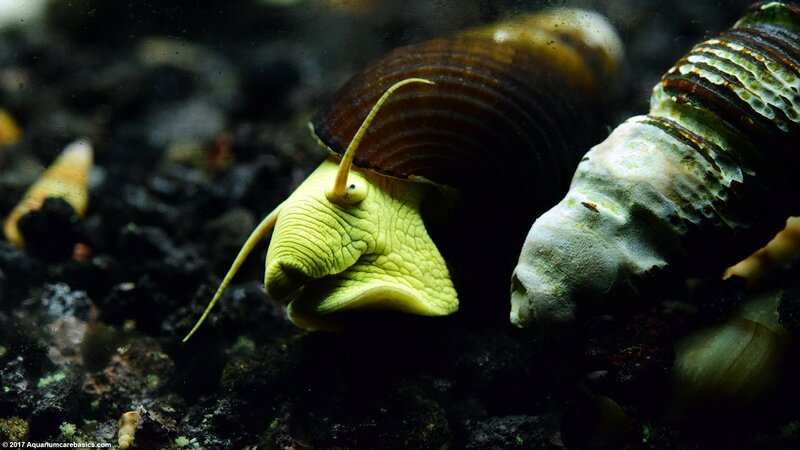 Also, keep in mind that Rabbit Snails may be kept in display tanks with roughens that may take nips at their tentacles, so be sure the snail looks complete before buying. There are several different types of Rabbit Snails available in stores today. 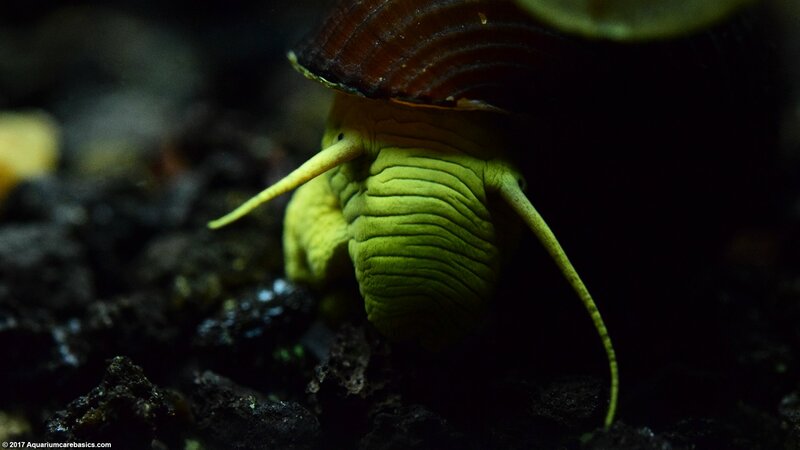 Some types of Rabbit Snails are called: Yellow Poso Rabbit Snails, Chocolate Poso Rabbit Snails, Golden Spotted Rabbit Snails, Yellow Spotted Rabbit Snails, White Spotted Rabbit Snails, Black Rabbit Snails, Orange Rabbit Snails, and Gold Rabbit Snails. Some types are more common than others. And its important to note that different pet stores may name each type differently. 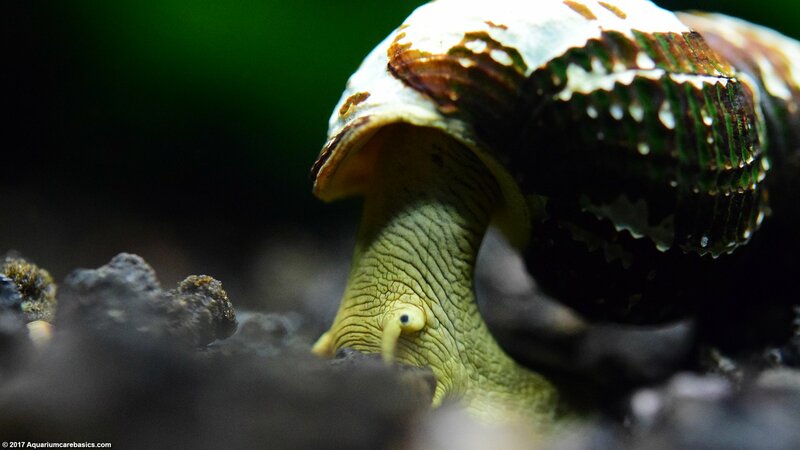 Many hobbyists feel that Rabbit Snail care is relatively easy. 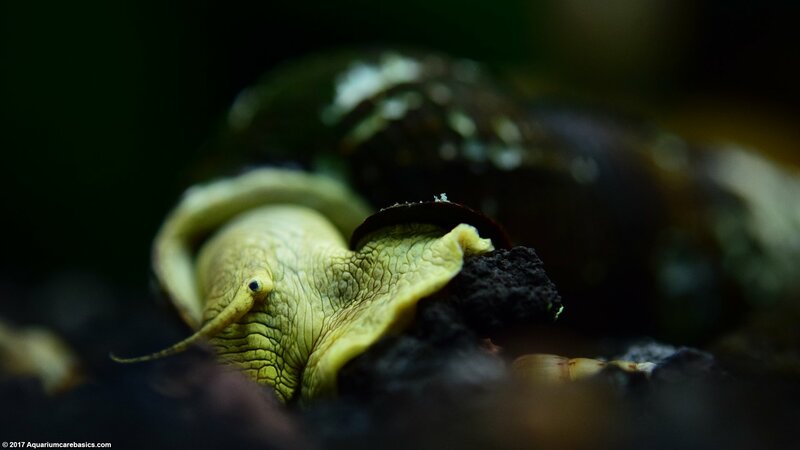 As with other freshwater snails, Rabbit Snail care starts with keeping them in a healthy, stable and established aquarium, preferably with substrate on the fine side. Its important to keep Ammonia and Nitrite levels at 0 ppm, and Nitrate levels in check as well. As with other freshwater snails, be careful with medications and plant fertilizers, as snails may be sensitive to them. And this is especially true with Copper. Copper can be harmful or fatal to Rabbit Snails. One reason Rabbit Snail care is easy is they seem content in community tank conditions, with water temperature on the warmer side. And hobbyists suggest its a good idea to keep tank water on the on the hard side so minerals are present for healthy shell growth. To that end, offering food supplements with Calcium are good idea too. 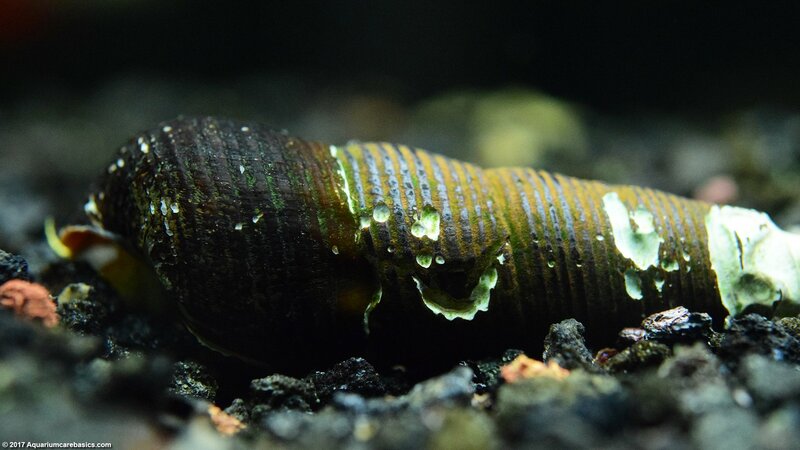 Another Rabbit Snail care issue involves the hazards of canister or power filter intakes. 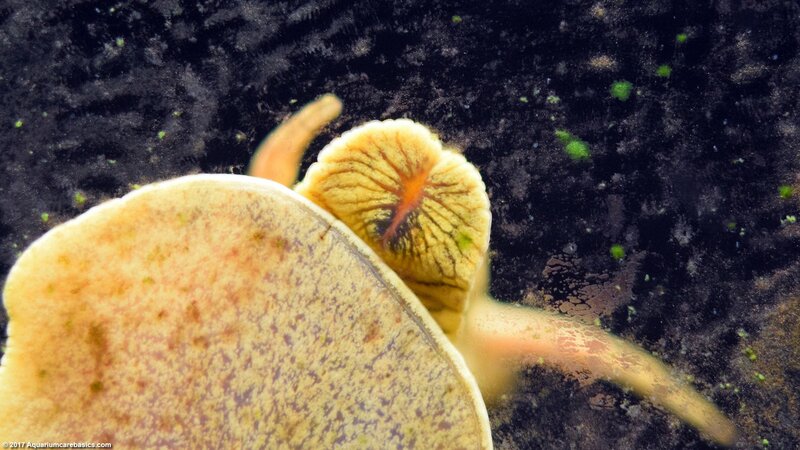 A Rabbit Snail may get its head or foot caught in the slots of filter intakes. If this happens, the snail may not be able to back itself out and begin become seriously insured or even killed. So its prudent to keep filter intakes covered with course sponge pre-filters to prevent accidents.Finally, its a good idea to keep tanks covered to the extent possible. 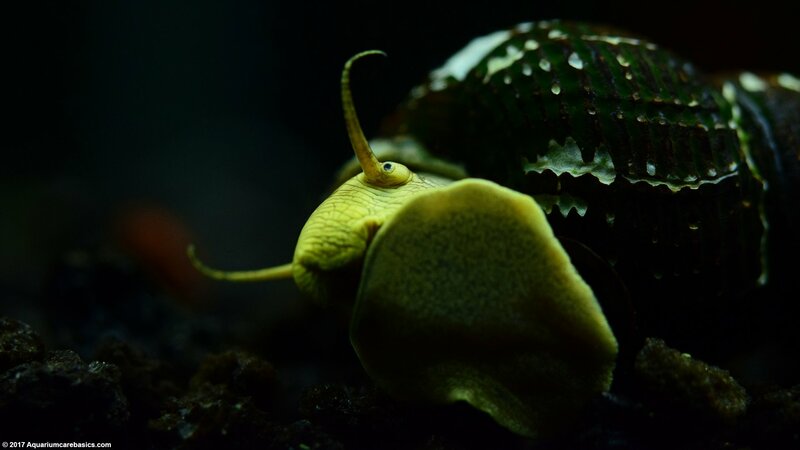 Although a Rabbit Snail may not be the escape artist a Mystery Snail is, it is possible they can make their way out of the tank, become injured and die. 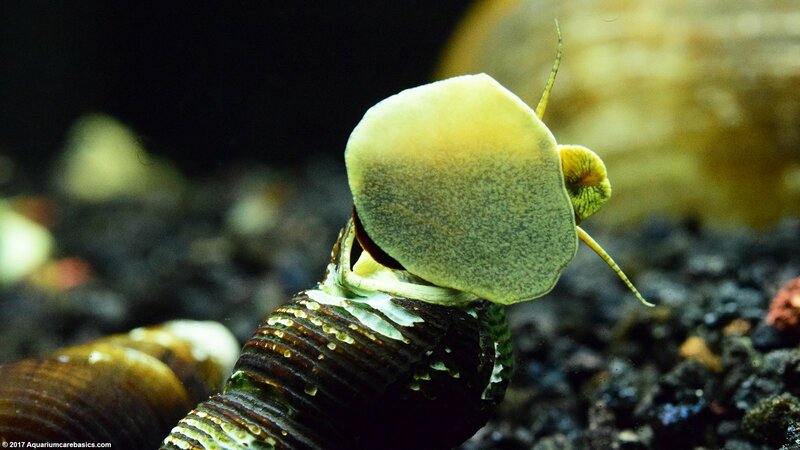 Rabbit Snail Size: As with other freshwater snails, Rabbit Snail size depends on age. The older the Rabbit Snail is, the longer it will be, all things equal. Most Rabbit Snails in stores will be about 2 inches long. Smaller snails do not necessarily mean unhealthy snails, it just means the snail is on the younger side. 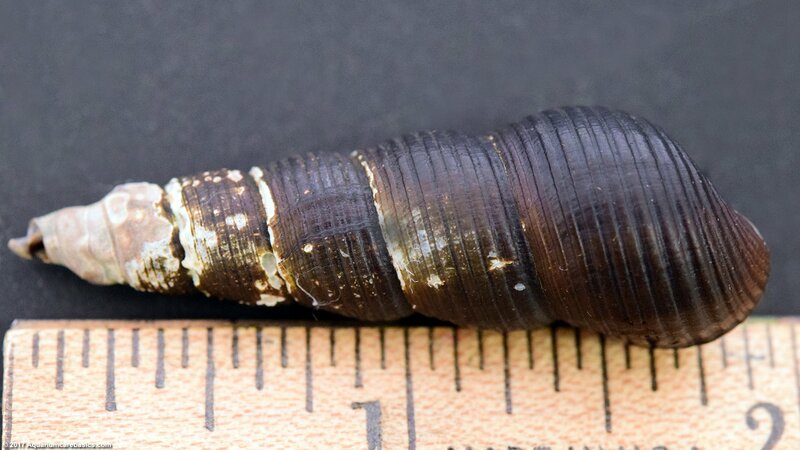 A Rabbit Snail shell is cone shaped, and have a grooved, spiral pattern that runs from the shell apex to the aperture. A Rabbit Snail shell looks similar to the cone shaped shells of Trumpet Snail and Assassin Snails. And Rabbit Snails have a small operculum used for defense, but unlike a Japanese Trap Door Snail, it covers only a portion of their aperture. 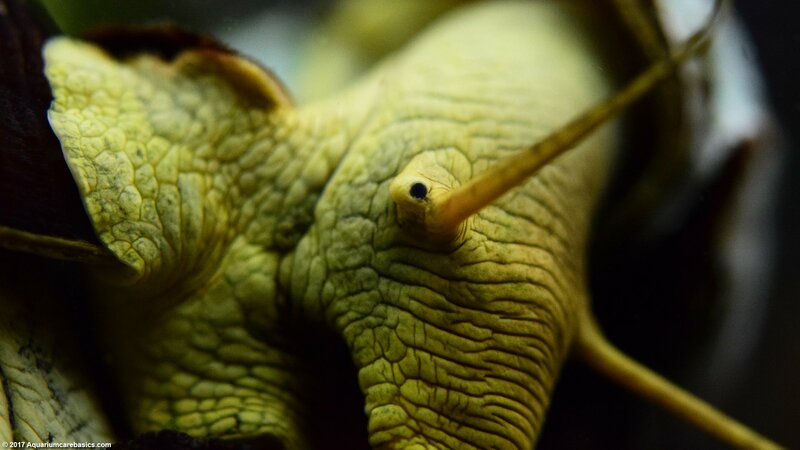 Tank Size: A Rabbit Snail should be in tanks with sufficient size and water volume to support its life. Therefore, tanks that are 29 gallons an up are a good start. 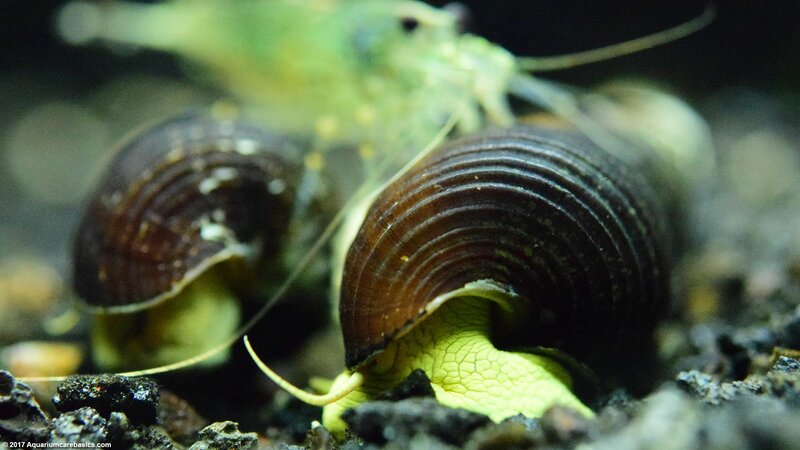 Keep in mind that Rabbit Snails, along with the other living organisms in a tank produce waste, so be sure to avoid overstocking. Tanks should have plenty of places to hide and explore. 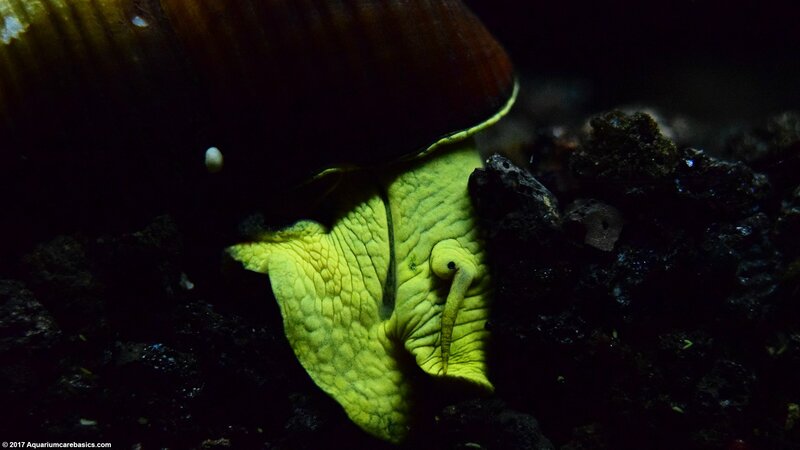 Diet and Feeding: A Rabbit Snail is a good scavenger, a ferocious eater and they seem very interested in eating some forms of soft algae growing on hard surfaces. 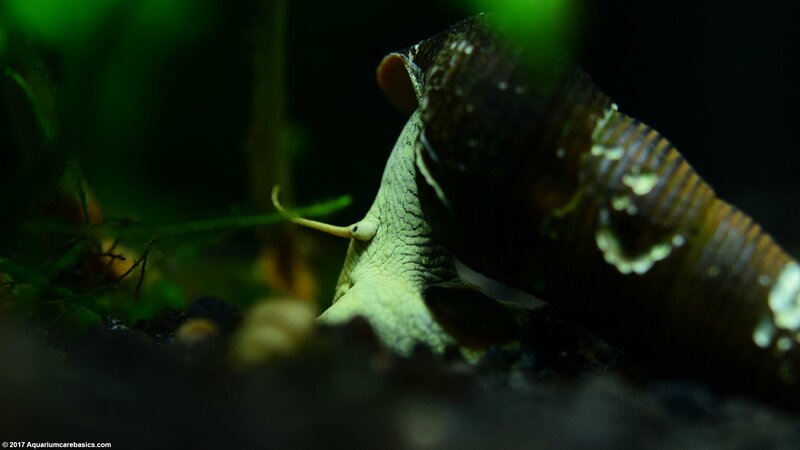 Rabbit Snails also seem to be interested in eat decaying plant matter that has fallen to the bottom of the tank. But their diet should not be limited to the naturally occurring foods in a tank. A Rabbit Snail should also be offered food supplements, especially those rich in Calcium. Hobbyists can try things like bottom feeder pellets, algae wafers, and fish flakes for starters. Other food sources can be blanched green leafy vegetables such as lettuce and spinach, as well as blanched green zucchini. Each situation will be different so try a variety to see what works. And be sure to remember that a Rabbit Snail cannot thrive simply on a diet of left-overs. They need to be offered a healthy, balanced diet. 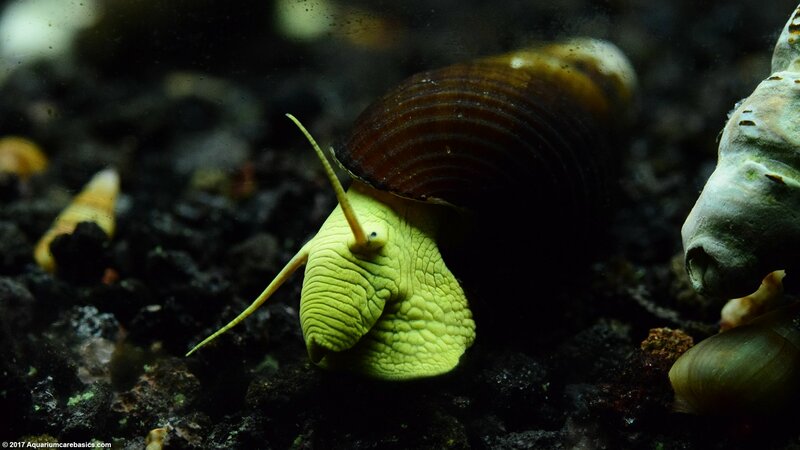 Note Regarding Live Plants: In general, a well fed Rabbit Snail should not be interested in devouring live aquarium plants. It is said that an exception may be Java Ferns. Hobbyist often report that Rabbit Snails are interesting in eating Java Ferns. 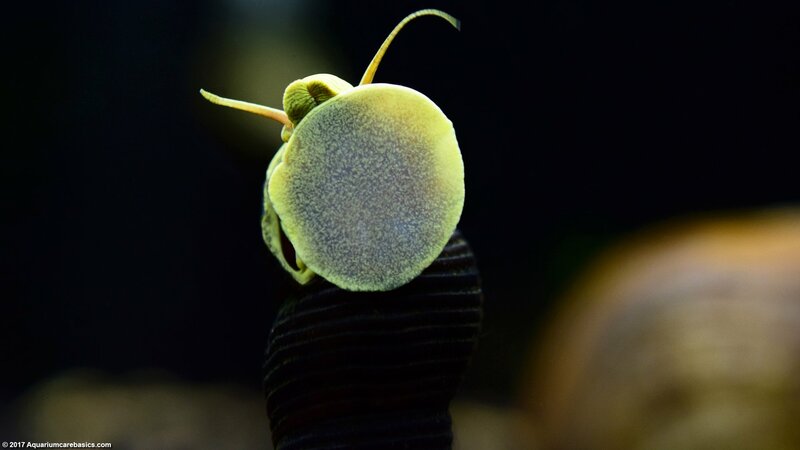 But other than Java Ferns, keeping Rabbit Snails well fed on a balanced diet of green leafy supplements, as well as keeping them with plants like Anubias with strong, durable leaves, plants should be relatively safe. 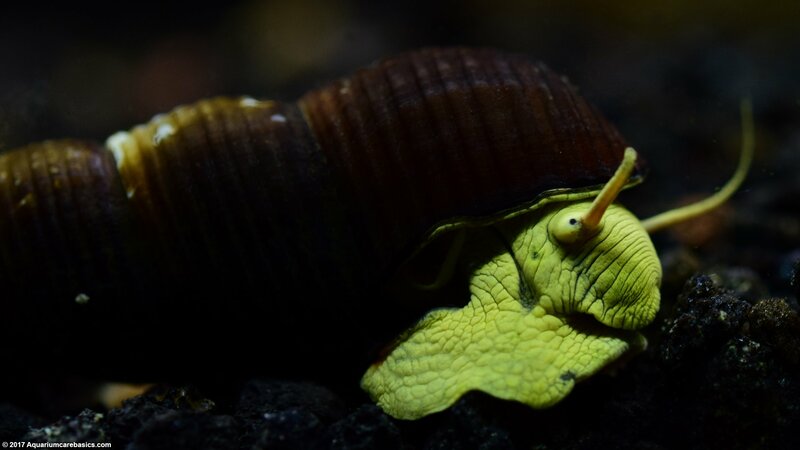 Rabbit Snail Lifespan: Under good conditions its likely that a Rabbit Snail’s lifespan can be 1 to 3 years, or maybe longer with a little luck. 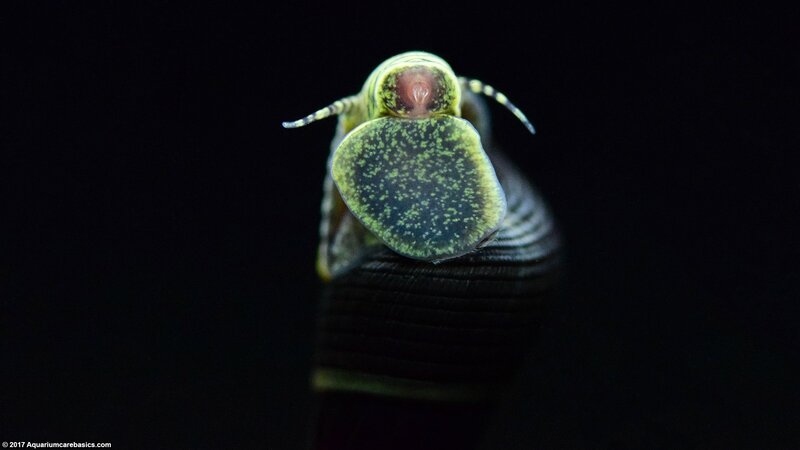 Also, although a Rabbit Snail is pretty active, its not uncommon for them to rest motionless for long periods of time. When resting, their bodies will be curled up into their shells and their operculum will pulled into their aperture. 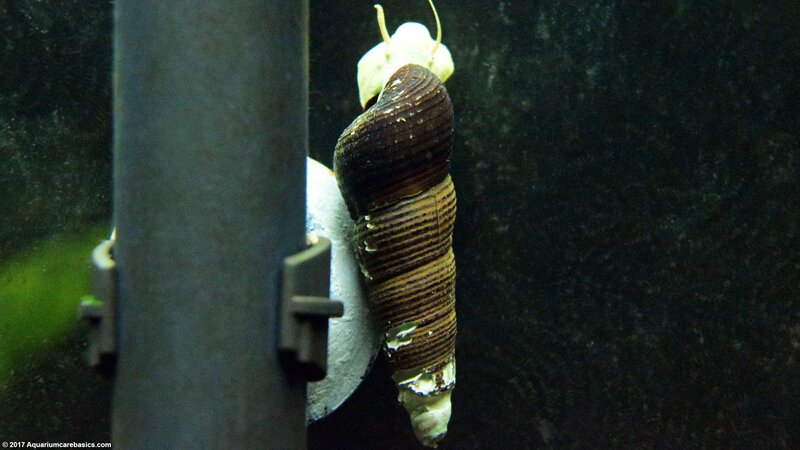 Just because the Rabbit Snail is not moving on the tank bottom, it does not necessarily mean it is dead or dying. Because a Rabbit Snail is slow moving and calm in disposition, they should be kept with other non-aggressive tank mates. 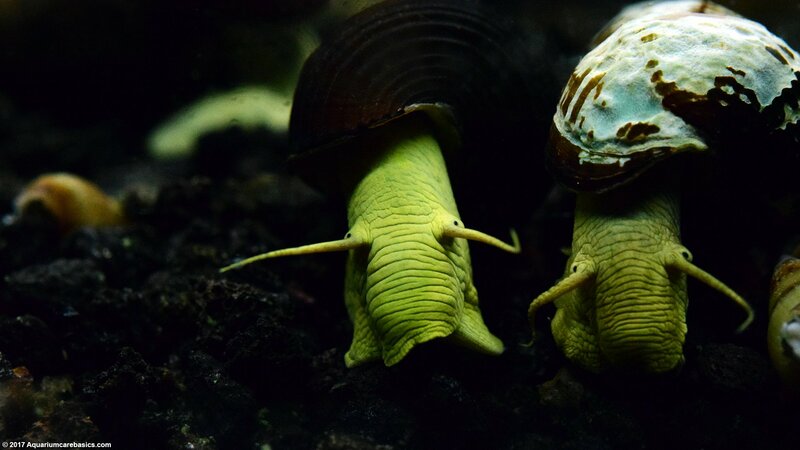 They get along well with others of their kind as well as snails like: Mystery Snails, Gold Inca Snails, Ivory Snails, Nerite Snails, Ramshorn Snails, Japanese Trapdoor Snails, and Malaysian Trumpet Snails. They are also compatible with freshwater shrimp such as: Amano Shrimp, Ghost Shrimp, Red Cherry Shrimp, Wood Shrimp and Viper Shrimp. Cory Catfish and Otocinclus Catfish are also good tank mates for Rabbit Snails. Many small community tank fish can also be good candidates, provided they are not the sort to be inclined to pick at the snails. Be sure to avoid rough and tumble types like Cichlids, Crayfish, Crabs, Goldfish and loaches, as they can eat, injure or kill the snails easily. As always, if there any compatibility questions, be sure to ask the store clerk for input before purchasing. 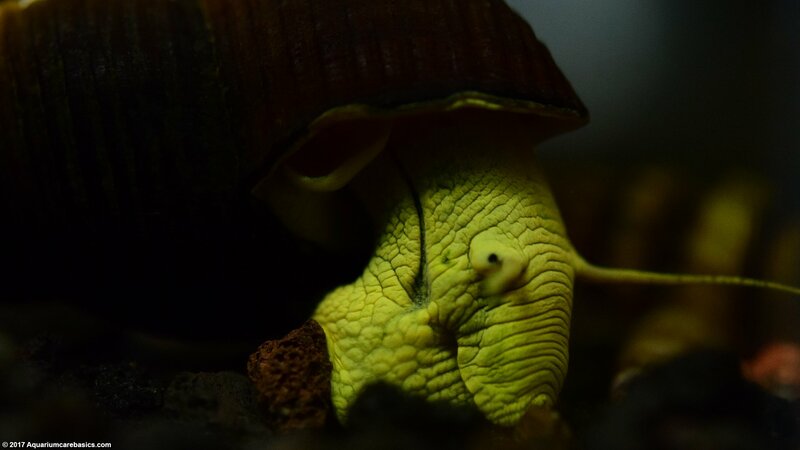 Its not uncommon for Rabbit Snail breeding to occur in freshwater tanks provided conditions are right. The good news is that Rabbit Snail breeding happens slowly. 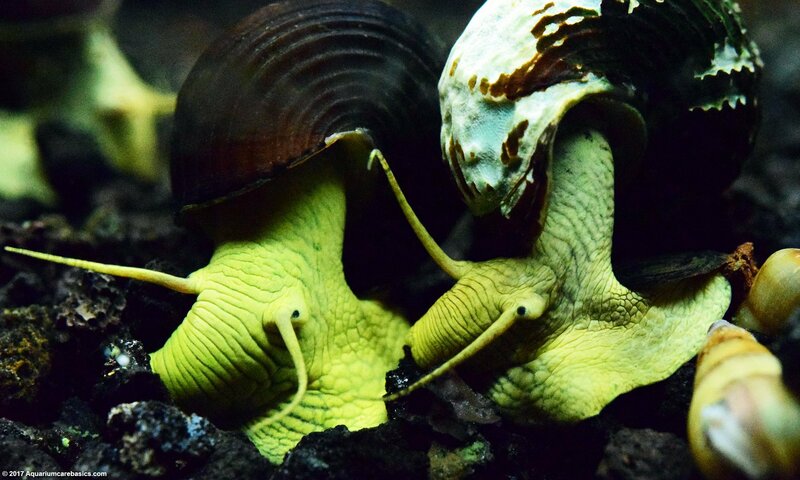 A Rabbit Snail produces one offspring at a time, so the tank does not get overrun like with many other snails. 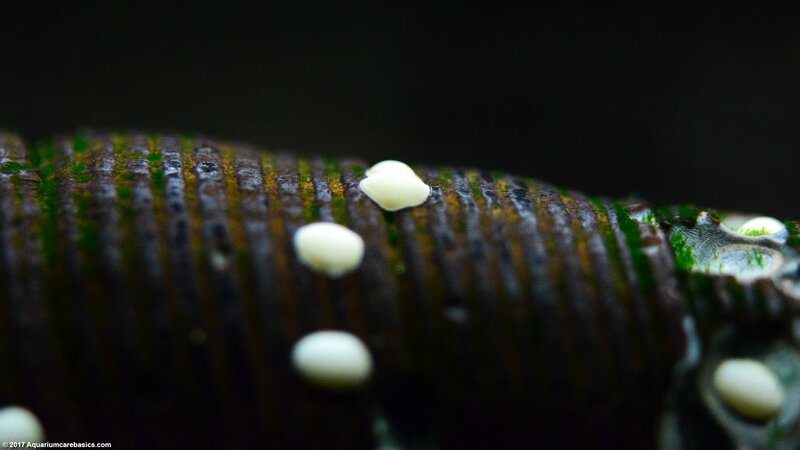 When Rabbit Snail breeding happens, the snail leaves a small creamy white egg sack behind. The egg sack is about the size of a pencil eraser. 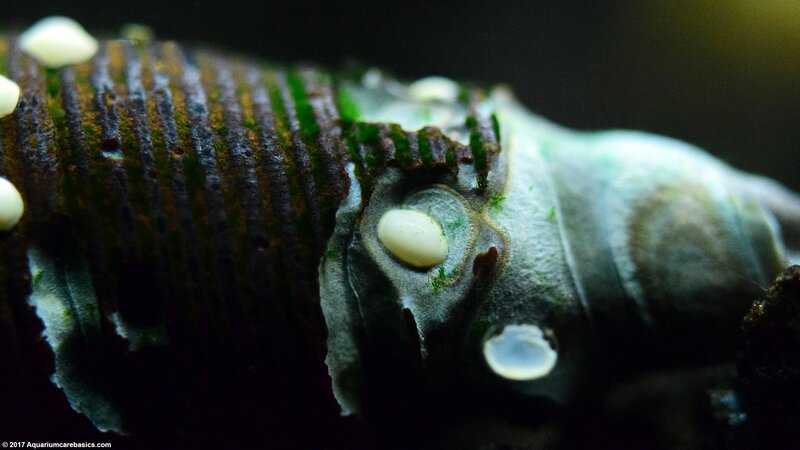 Inside the egg sack is a fully formed baby Rabbit Snail, that emerges very hungry. 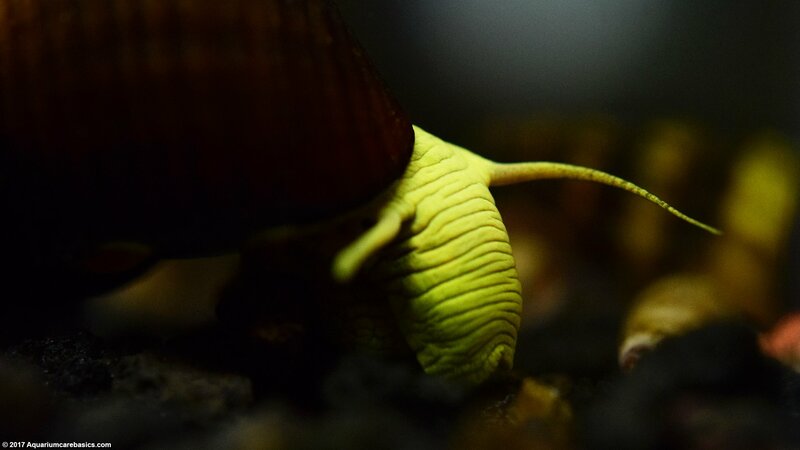 The baby Rabbit Snail will almost immediately begin scouring the tank for soft algae or other food to eat. One of the nice things to observe about a baby Rabbit Snail is how flawless its shell appears. No pit marks or scuffs, just a well formed whorl from apex to aperture.